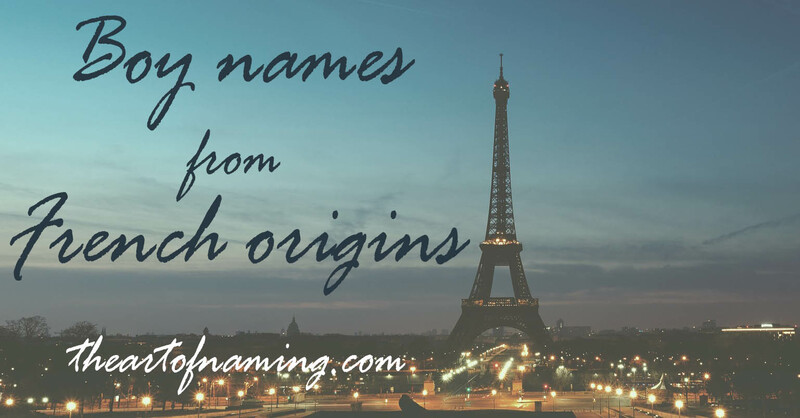 Here are some interesting boy names that originate from Norman French or Old French origins. These have a variety of popularity and usage levels in the US. Amis/Amias/Amyas - medieval names taken from Amice and the Latin amicus meaning "friend". It was popular in the middle ages. There is also a medieval French poem titled "Amis and Amiles". While Amis only landed on the US popuarity charts once with 5 births in 1928, Amias is skyrocketing. It first appeared in 2000, but since then has climbed its way up to the Top 1400 with 116 births in 2016. It should continue to gain popularity and break into the Top 1000 soon. Amyas is also starting to appear. Courtney - An aristocratic English surname taken from the French place name Courtenay, which came from currents from the Latin curtus meaning "short". Courtney has always been unisex. Up until the 1960s, it was mostly given to boys, but after that the majority of usage went to the girls, especially in the 1990s. Deforest/Deforrest - from a French surname meaning "from the forest". Both spellings are rare. They aren't seeing any usage today, however Deforest did have mild usage around the 1920s. Deforrest is more hit or miss, but popped up on record a handful of times since the 1910s. Gage - Old French name meaning "measure" or "pledge" which refers to one who was a moneylender. Gage first popped up on the record for boys in 1914, but was rare until it entered the Top 1000 in 1989. Its highest ranking occurred in 2003 at #136. It is trending down now, ranking at #281 in 2016. Garner/Garnett - An English surname taken from the Old French carne which referred to a person who made hinges. Garner has been used for boys in the US since 1881, rarely at first, but more regularly after 1908. It has never been common, always just 30 or fewer births per year. Garnett dates back just as far and was similarly rare over the years but with slightly bigger numbers. Garnett hasn't been used on record since 2013. Garner is still around with 22 male births in 2016. Grant - a surname taken from the Norman French word grand meaning "great, large". The usage of the name Grant dates back to the beginning of record-keeping in the US, 1880. The name has only gained popularity over the years, getting a boost around 1912, and another in the late 1970s. It ranked highest in 1997 with 3,314 and a rank of #115. As of 2016, it remains a constant by ranking at #171. Jourdain- French form of Jordan which comes from the Hebrew yarden and yarad meaning to "descend" or "flow down". Jourdain has only had usage for boys between 1984 and 2012, the best year being 1996 with 20 births. Lamar - from a French surname and a place name in Normandy, which was derived from Old French la mare meaning "the pool". Lamar has been in usage since 1882 in the US and has almost always been in the Top 1000. It's best year for boys was 1989 with 737 births. Mel/Melville/Melvin - a Scottish surname derived from a Norman French place name meaning "bad town". Melville was in use from 1880 up until it lost popularity in 1981. Melvin has always been in the Top 1000 but is currently trending down quickly. It was most popular between 1920 and 1950. Monte/Monty/Montgomery - surname meaning "Gumarich's mountain" in Norman French. I was surprised to see the popularity of Monte over the years. It dates back to 1881 on record and ranked in the Top 1000 from 1924-1990. It still received 109 births in 2016 for boys. Monty is a bit less popular with only 45 births in 2016. Montgomery gained steady usage back in 1905 but was always uncommon. 2016 was actually its best year with 115 births. Noel - This name means "Christmas" in French and had often been given to children born in the holiday since the middle ages. Noel has always been used in the US and it has been steadily gaining popularity since 1880. As of 2016, there were 844 boys named Noel (and 202 girls). Parris - from an English surname denoting a person who came from Paris, France. Parris started out with usage on boys, but as of 2016, there were 26 girls given the name, and only 14 boys. It has never been common (in this spelling) for either gender. The spelling Paris, however, ranked at #274 for girls with 1,152 births, and only 80 births for boys. Quincy - A surname derived via the French place name Cuinchy, which is based on the Latin quintius referring to the number 5. Quincy peaked in popularity in 1977 with 717 male births. It has fallen to 473 births in 2016, but it is also starting to rise for girls. Régis - This name comes from a surname meaning "ruler" in Occitan, which is a dialect spoken by 1.5 million people in Southern France. Régis was the name of a 17th century French Jesuit priest: St Jean-François Régis. This name gained usage in the early 1900s with its best years being between the 1910s and the 1950s. It left the Top 1000 in the early 1960s and only had 13 male births in 2016. Seymour - This comes from a Norman surname originally referring to a person from the French town of Saint Maur, derived from Saint Maurus, Maurus being from a Latin name meaning "dark skinned". Seymour had one giant popularity peak in 1924 for boys consisting of 785 births. It fared best between 1912 and 1939 and dramatically declined in usage after that. Many years after 1979 didn't have at least 5 births in a single year in order to be on the record. There were 9 births in 2016. Sinclair - There is a Norman French town called Saint Clair which led to the surname Sinclair in honor of it. Clair comes from the Latin Clarus meaning "clear, bright, famous". Sinclair has been used for boys since 1900 but has never had more than 30 births in a year, including 12 in 2016. It gained usage for girls in 1989 and has more recent usage than for boy over the past two decades. There were 9 female births in 2016. This is a rare unisex name. Taylor - An English surname referring to someone who was a tailor. It comes from the Norman French tailleur, from the Latin taliare meaning "to cut". Male Taylors have a good 71 years of usage on the females. Boys date back to 1880 while the girls gained usage in 1951. It was more popular for boys until 1990 when it began surging upward for females. There were 3,261 girls named Taylor and 639 boys in 2016. Wallace - from a Scottish/English surname denoting a Welshman or a "foreigner" in Norman French. Wallace peaked in popularity in 1923 with 2,803 births, but it declined again nearly as fast. It hung on through the 1940s but left the Top 1000 by 1994. Today it is showing signs of gradual recovery by earning 196 male births in 2016. 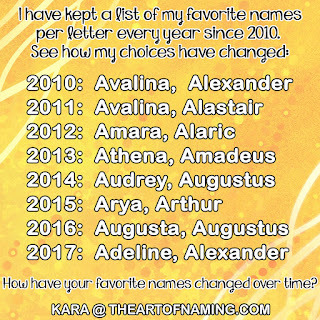 Which of these names do you like? Would you use any of them? Interesting and Uncommon Boy Name Combinations!